Tuesday morning on August 2nd, I was 9 days overdue and more than ready to have this baby. Most of our family had been in Seattle for a week, waiting for Tatum’s arrival, and had already had to go back home. I was trying everything suggested that was given the green light by my midwife, Chris, and after walking miles and miles, scrubbing my floor on my hands and knees, having acupressure massage every night by my family, eating tons of spicy food, consuming a whole pineapple in one sitting, taking evening primrose oil and a host of other serious and not-so-serious attempts, I was basically done trying and ready to let nature take her course. I had been having consistent Braxton-Hicks contractions since the previous Friday night—anywhere from 2-7 minutes apart. No pain, they didn't hinder any sleeping and I hardly noticed them…I just kept waiting for them to roll over into actual labor. I had never wanted to feel some pain so much! On Tuesday at our appointment at noon, Chris checked me and we were surprised to find I was dilated 3 cm and 50% effaced! Those Braxton-Hicks had been doing something! She stripped my membranes. UN-COM-FOR-TABLE (Read: ouch)! It was pretty amazing that Chris would gently push on Tatum’s head and I’d see my whole belly move! Weird that someone can touch your baby inside you before you can! After heading back home, I laid down for a nap but never fell asleep—just rested. The contractions seemed to be getting a bit stronger, and by 3:00 I knew I wouldn’t be able to fall asleep. They were about 10 minutes apart, but I had to breathe through them. I got up and told my mom I thought this might be the start of things, and we started a puzzle and let Matt sleep a bit more. By 4:00 I couldn’t sit down, and even just standing bending over the puzzle was becoming a challenge. I was so afraid it would peter out, though; I didn’t want to wake Matt or call anyone just yet. My mom suggested a walk and so we slowly (and uncomfortably) walked once around the neighborhood—me having to stop and breathe through contractions. I was getting a little nervous…if this was only an hour or so into labor and was starting to take my breath away, how would I handle the amount of hours left? Back in our house, Matt got up and I told him I thought I was (finally) in labor. It was getting close to 6:00, and the contractions were definitely becoming more intense. I was beginning to vocalize a bit through them at this point. I asked for some music because the silence in between the contractions made me feel so watched, so Matt put on some country music. Something about the Dixie Chicks proved to be extremely irritating, and after another contraction all I could verbalize was I wanted something with no words. Matt then put on some classical music, but Mozart wasn’t cutting it either. Finally he put on the soundtrack to Pride & Prejudice, and the music of Jean-Yves Thibaudet hit the spot and carried me all the way through the actual birth. Matt called Chris and let her know things had gotten started and contractions were between 2 and 4 minutes apart, I talked to her and had a relatively easy contraction on the phone, and she said to call back in an hour. Then the first serious pain hit and I was not prepared for it. I became a bit hysterical and didn’t know what to do—meanwhile I was thinking if this was only the beginning…how much worse was it going to get? My mom and Matt were both unprepared for the sudden intensification as well, and I just stood there crying “What do I do?!?! What do I do?!? !” until Matt brought some flowers and told me to breathe in and look at the rosebud, and breathe out and look at the unfurled rose. That helped me through that one and then out came our cheat sheets for my mom and Matt to help me know what to do through contractions. One of my biggest fears had been not knowing or remembering what to do during a contraction, and it turned out I couldn’t remember anything to try to cope except to keep breathing deep. After that the contractions came fast and very strong—most of them double and sometimes triple peaking. I would only get a minute or two in between before it would hit again. I tried laboring on my hands and knees, squatting, and got in the shower but nothing seemed to help me get in a rhythm. I was definitely vocalizing through at this point, but the pain was so shocking it was literally taking my breath and I was giving high pitched yelps instead of letting my voice be low and open. Even between contractions I was still at a pain level of 4 or 5 and after what seemed like just a few breaths I would feel another wave hit. Matt called Chris at 6:40 with an update that things were getting pretty intense, and again I got an easier contraction while talking to her. I even told her, “Can I just stay on the phone with you? They’re easier!” I gave the phone back to Matt and right as she was telling him to call back in 30 minutes a real contraction hit. I was vocalizing through it and Matt let Chris listen. At that point she said to get in the car and get to the birth center! THANK GOODNESS! We got to the birth center and I was stripping and headed towards the tub as soon as I crossed the threshold. All that thought of what I was going to wear to give birth went out the window. Bikini top? What bikini top? I didn’t care if Billy Graham had been sitting in the corner--I was getting into that tub as fast as possible! The second I got in the water things got much better. It was such a relief, and contractions slowed down a bit giving me a few minutes of much needed rest in between. Chris checked me and I was relieved beyond belief to find out I was 9 cm dilated and 100% effaced! It was definitely reassuring I wasn’t going to have to be doing this for that much longer! That knowledge and the relief from the hot water helped give me the energy and the confidence I could finish this how I had wanted--drug free and in the water. Matt got behind me with a cold washcloth, and I held onto his hand like it was a lifeline. I was finally able to get into a rhythm, moaning “Oooo-kay, ooooo-kay, oooo-Jesus” and staring at a fixed point of the painting on the wall. 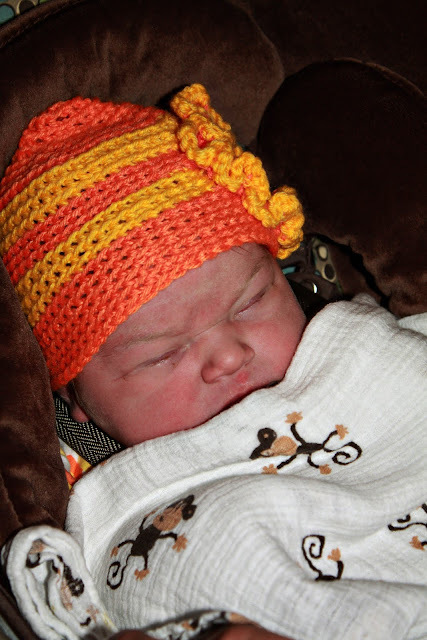 During some of the harder contractions I would ask frantically, “Is this normal?!?! Tell me I’m OK!! 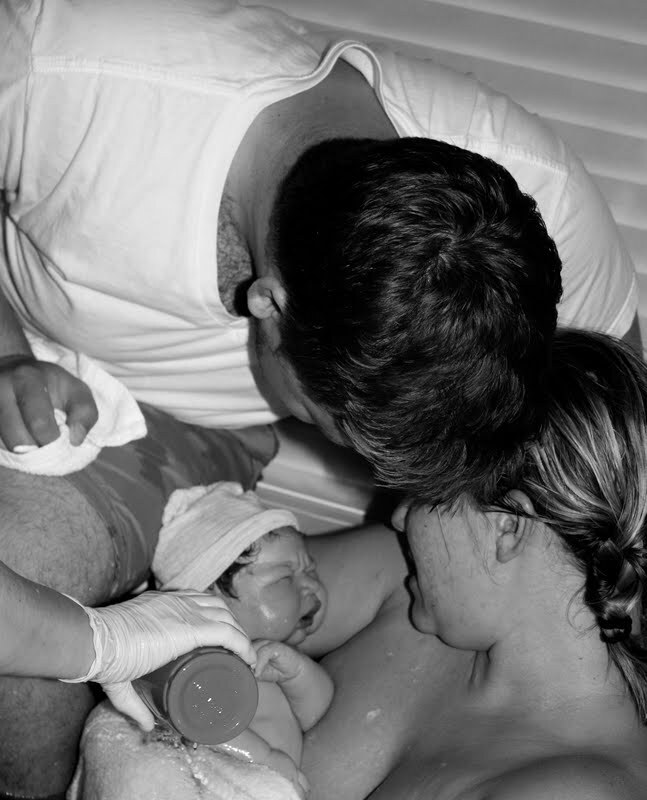 !” Chris would get right in front of my face and reassure me that this was totally normal, that this was just a really fast labor and that soon our baby girl would be in my arms. After about an hour I began to feel the urge to push. I moved to a different corner of the tub, Matt put his feet in and sat next to me, and when pushing I would pull myself up with his hand and by holding onto the faucet. Focusing on putting effort into pulling my hips up let me relax everything else. Matt began to do my moan/chant with me and it was oddly comforting and irritating at the same time. It was comforting he was doing it with me, but I knew I’d be irritated if we went out of sync so I worked on matching him as he matched me—which in hindsight was probably really helpful in making sure I was taking deep long breaths! Twenty minutes into pushing Chris could see the top of her head. From then it was really encouraging because with every push Matt, my mom, Chris and the student midwife would get really excited about getting to see more of the baby! They held a mirror for me and I got to touch her sweet little head and feel a long lock of hair, but then I had them take it away because I was pushing better with my eyes closed. It only took 7-10 more minutes of pushing before Tatum Keturah came into the world all at once with one gigantic push at 8:52 pm. I immediately felt such a release of pressure! She came out of the water squalling but within a few seconds of me talking to her she was quiet and calm. Right away she pooped twice in my hand (ahh love), and after a few minutes Matt was able to cut the cord. She was so calm and alert after we started talking to her! Auntie Charissa who sped all the way from Portland and still missed the birth--but she was definitely still needed! 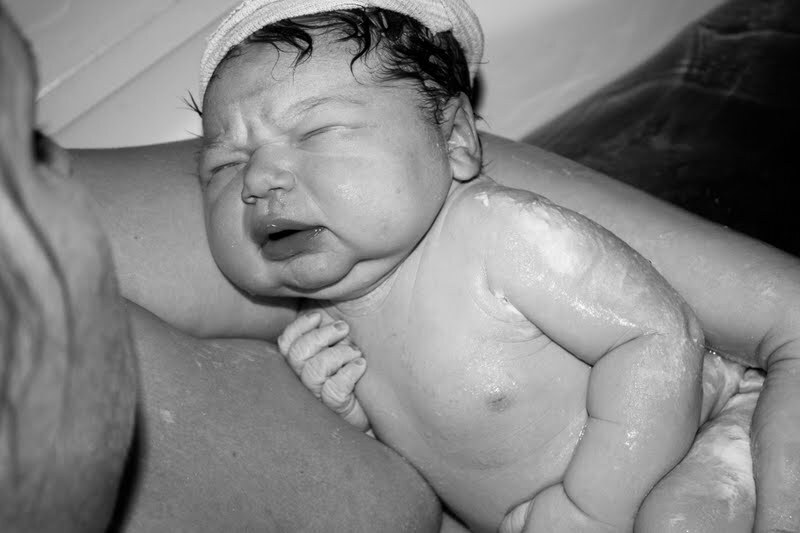 She weighed 9 lbs 15 ½ oz, and was 21 ½ inches long. When the ultrasound technician had said wide margin of error for their guess of 9 lbs 3 oz, I was thinking she would be smaller, not a nearly 10 lb baby! Even with that, I only had minor second degree tearing. 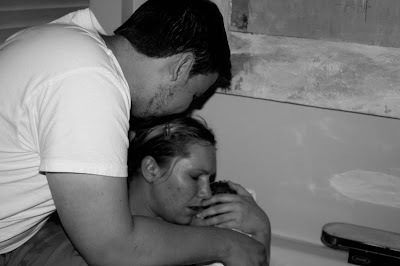 After I delivered the placenta and showered, I got to nurse Tatum for the first time. She was a little champ (or chunk) and nursed for a long time that first time! 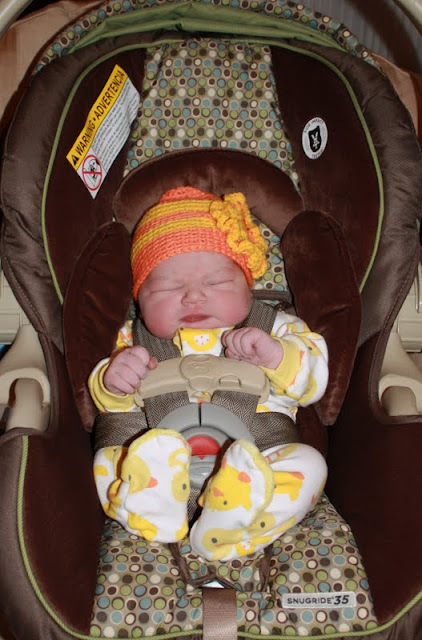 We got to take her home when she was 4 hours old, and it was so nice to be able to sleep (I actually just stared) in bed with a baby beside me, where less than 12 hours earlier I had been napping uncomfortable at 41 weeks pregnant!